Yoga Vidya Mandiram invites you to join their 50-hour yoga teacher training in Thailand. The special highly intensive yoga teacher training program is dedicated to many students who desire to step into the path of yoga and meditation but are still caught up in the midst of the modern lifestyle that allows only so much time one can take off from the fast-moving life. The teachers have been brought up and spent their lives in traditional ashrams and gurukulams with yoga and meditation as their sole purpose in life. In this special occasion, they are traveling to Thailand with the pure intention of transmitting authentic knowledge of yoga and meditation from the ancient Vedic scriptures. The mission is to spread peace, health, and joy, which can be achieved through yoga. All walks of life are welcome to learn how yoga leads an individual to a healthy body and lifestyle! You will be accommodated for six nights at Maewin Guesthouse & Resort. The accommodation for the training is a traditional Thai-style second-story wooden house. The 2nd floor has a view of the farmland, forest, and mountains and three dorm rooms (three-four people per room). There is one bathroom in each room, one small kitchen and common space on the first floor. The house is situated in a private family farm owned by a local Thai lady, who is the owner of Maewin Guesthouse & Resort. The farm is a few minutes walk from the guesthouse and all guesthouse facilities are also available to our students (i.e. dining area, common resting area, cleaning service, etc.). However, students can also opt for a private room at extra charges. Private rooms will be within the guesthouse area instead of on the farmland, but it is only a few minutes walking distances between the locations. This teacher training is a multi-style program for beginners with basic knowledge of yoga. After the completion of the course, the students will be given a certification of the completion of the 50-hour yoga training program at Yoga Vidya Mandiram School. This 50-hour yoga teacher training will be held by experienced reputed meditation guides and the team of accomplished yoga teachers. The teachers and guides are including an Ayurvedic doctor who feels privileged to share his / her knowledge and practice of ancient traditions with modern elements of medical sciences (yoga anatomy and physiology). This training program aims to provide a solid foundation in different aspects of yogic disciplines that prepare them to apply for the 200-hour yoga teacher training program. In addition, this 200-hour yoga training program includes mantra recitation (mantra - Japa), daily joints and glands practices (granthi - vimochana - kriya), yoga postures (yoga asanas), meditative steps of doing asanas, six cleansing exercises (shat karma), science of breath (pranayama), yoga energy locks (Bandha). It also includes yoga gestures (Mudra), meditation (Dhyana), yogic sleep (yoga nidra), history and philosophy of yoga (yoga Darshana), yogic anatomy and physiology of human body, basic principles of Ayurveda, asana alignment practicum classes, yoga teaching practice, and teaching methodology. Note: The schedule is subject to change. It is advised that you arrive at the training at least one day before the program. Acharya Chandramani was born in a traditional spiritual family. At 8 years of age, he became a serious practitioner of the yogic principles of Swetambara Jaina tradition. Later he was initiated into the Vedic Sanskrit tradition by Swami Vivekananda at the age of 10 in Prabhat Ashram, UP, India. Acharyaji was fully dedicated to the teachings and daily discipline of the traditional Sanskrit gurukulam from childhood to adulthood. He has been guiding worldwide yoga students into the Vedic Sanskrit literature and its philosophy and holding yoga retreats and teacher trainings for over 25 years. Yoga Vidya Mandiram will be holding this unique training at MaeWin Guesthouse & Resort in Chiangmai, Thailand. The mountain ranges of Chiangmai are part of the system of hills extending through Laos, Burma, and China. It is here that begins to rise the chain of the Himalayas and the place includes the highest peaks in the country, Doi Inthanon. The fertile region of mountains, valleys and rivers, the North and its provinces are a paradise for nature lovers. Maewin Guesthouse is a peaceful and quiet country resort located in one of the most beautiful parts of our valley, Mae Wang. Chiang Mai is 55 kilometers from Maewin Guest House and Resort, while Mae Rim is 43 kilometers from the property. Chiang Mai International Airport is 36 km away. Offering you the most relaxed and tranquil stay possible is their primary target. Their rooms vary from a number of private bungalows with terrace to a big Thai-Lanna style teak wood house. Due to our convenient situation in the unspoiled Karen village Mae Sapok, located on the outskirts of Chiang Mai, they are able to provide you with numerous adventures. Beautiful waterfalls, the king's royal project, elephant sanctuaries and Thailand's highest mountain are only a few of the places that can be easily visited from here. With a breathtaking landscape and nature, we also provide a number of trekking and hiking tours. Furthermore, professional Thai massages can be arranged privately in the room. The Mae-Win valley offers the perfect mix of unspoiled natural beauty and insights into the charming culture and lifestyle of the local people. We at the Maewin guesthouse await you to experience our unique hospitality and an unforgettable stay. 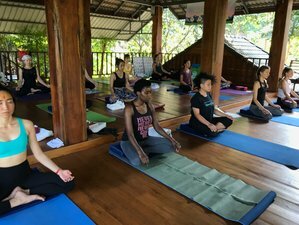 During this yoga teacher training, there will be daily nutritious vegan breakfast, lunch and dinner along with seasonal tropical fruits. Herbal tea and local herbal detox drinks, as well as occasional traditional Thai desserts on special days, are also available. Yoga Vidya Mandiram takes extra care of the food they provide. The food is carefully prepared with organic vegetables and ingredients. They have hired a local Thai cook to prepare homemade Thai vegan/vegetarian meals for the duration of the training. If you are traveling from within Thailand, you could take the train from the city you are into Chiangmai province. From Bangkok, the journey takes about 12 hours but evening trains feature comfortable bunks with or without air-con. Train tickets from Bangkok are between 600 - 1,000 THB for a train ticket depending on the level of comfort you want. Buses run roughly every hour from Bangkok to Chiang Mai, departing from Bangkok’s Mo Chit Station and arriving at Chiang Mai’s Eastern (main) Bus Terminal. The first departure of the day is at 05:30 and the last is at 22:00. From Bangkok, the journey takes about 10 hours and there are a variety of buses available, with the VIP buses being the by far the most comfortable. Bus prices range from 12 USD to 25 USD per trip from Bangkok to Chiangmai. Maewin Guesthouse & Resort is 38 kilometers in the southern direction from Chiangmai city and 36 kilometers from Chiangmai International Airport (CNX). The bus for Mae Wang district leaves from the corner of Wualay Rd. and Chang Lor Rd., opposite the Chiangmai Gate (1 of the 4 city gates) on the south side of the moat that surrounds the old city. Look for a bus that goes to บ้านกาด (Baan Kaad), it’s a yellow pick up truck with seats at the back and a sign on the roof, the route stops in Mae Wang. Sit to the end of the line which is 5km passed Baan Kaad fresh market. The ride will cost only 35 baht per passenger. From there, you have to pay an extra fee of around 250-300 baht to reach the guesthouse. Yoga Vidya Mandiram is happy to assist you in arranging a taxi pick up once you arrive in Chiangmai. The taxi fee and travel time will depend on your pick up location and traffic. It is an average of 1.20 hours from Chiangmai International Airport (CNX) to the guesthouse by taxi and costing around 1,000 BHT per trip. Airport: Chiang Mai International Airport Airport transfer available: Chiang Mai International Airport Additional charges may apply. You can request this in the next step.